Dr Lindy Edwards is a political scientist at the University of New South Wales. She wrote How to Argue with an Economist (2002, 2007) based on her time as an economic adviser in the Prime Minister’s Department. She writes regularly for The Age. 21 Nov 2012 – Abbott’s attempts to explain ‘authentic aborigines’ was more than just rude. 18 Oct 2012 – How our politicians view the world has a direct impact on people’s everyday lives. Lindy Edwards The PM is using a strategy not seen in politics for a generation. Lindy Edwards The size of the deficit should not be the major concern. Lindy Edwards The ALP was undone by party strategists’ loss of belief in democracy. Lindy Edwards Labor is limited by the fear it will split its core constituency. 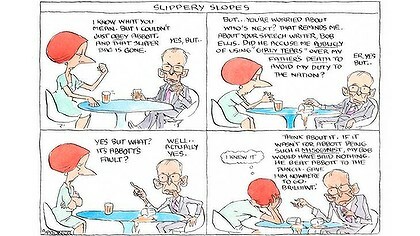 Lindy Edwards By opting for caution, the PM injects realism into his message. Lindy Edwards Tony Abbott looks to have made his version of John McCain’s “Sarah Palin blunder”, but that is not his greatest challenge as he endeavours to create a new conservative party. Lindy Edwards The Liberals might be able to paper over their differences on climate change, but there is a deeper split that will be harder to overcome. Lindy Edwards The Liberals have to learn not to promote leaders too early. Lindy Edwards The 10th anniversary of the referendum reminded me that I should dust off the old ”Young Australians for a Republic” banner in the shed and drop it off at the national archives. Lindy Edwards The embattled Coalition leader does not know how to play the game. Lindy Edwards Australia is heading down the path of becoming a society with an ever-deepening chasm between rich and poor. Lindy Edwards The simplicity of public debate does not foster innovative thinking. Lindy Edwards The PM should be judged on his response to this growing problem. Lindy Edwards Equality may be bad for the economy, but the alternative is worse. Lindy Edwards Thinking ethically may be the shake-up that allows us all to prosper. Lindy Edwards Treating cultures as a homogenous group doesn’t reflect reality. Lindy Edwards The proposed emissions trading scheme squibs on the hard decisions. Lindy Edwards We must make peace with the atrocities committed in its name. Lindy Edwards The Government needs a change of tack to repel the rhetoric over debt. Lindy Edwards The PM could make his mark on history or land us in trouble.